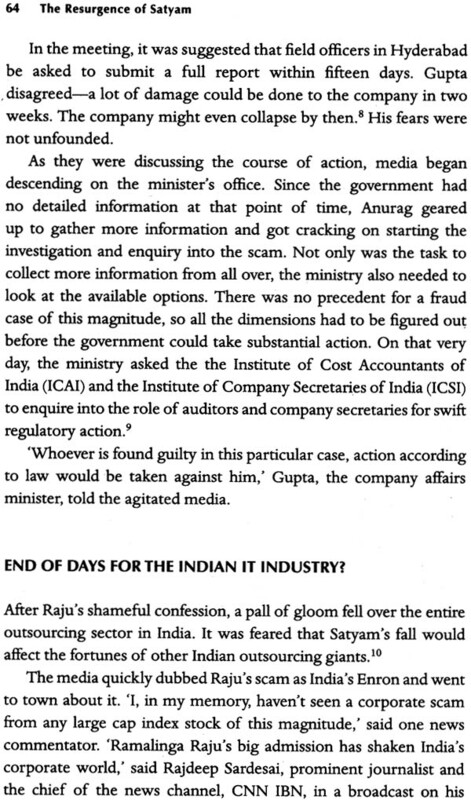 All hell broke loose with a simple confession from Ramalinga Raju founder and chairman of Satyam Computers, the fourth largest IT company in India with over 50,000 employees and business in more than 66 countries. His admission in 2009 of cooking the books to show exaggerated profits combined with the diving economy rocked India Inc and forced it to look inwards. With robust research, interviews and stories-Zafar Anjum tracks the chronicle from Raju's confession and Satyam free-falling to the phoenix's rise as Mahindra Satyam. This is a tale of betrayal and devastation. but more importantly of hope and resurrection. With an afterword by Anand Mahindra, chairman and managing director of Mahindra Group. The Resurgence of Satyam is the definitive book that will answer all that you wanted to know about the Satyam saga. Zafar Anjum is a Singapore based Indian Journalist and writer. He has been writing fiction and essays since 2000. Over the years, his writing fiction and essays since 2000. Over the years, his writing has appeared in periodicals and websites in India, U.S. UK, Hong Kong, Singapore, and other countries. Zafar ia s cineaste, an avoid blogger (dreamink, blogspot.com), and editor of Kitaab.org, a website dedicated to Asian Writing in English. An award-winning Journalists-Zafar works as the Asia Online Editor for Fairfax Business Media's technology publications including Computerworld Singapore, Computerworld Malaysia, CIO Asia and MIS Asia. 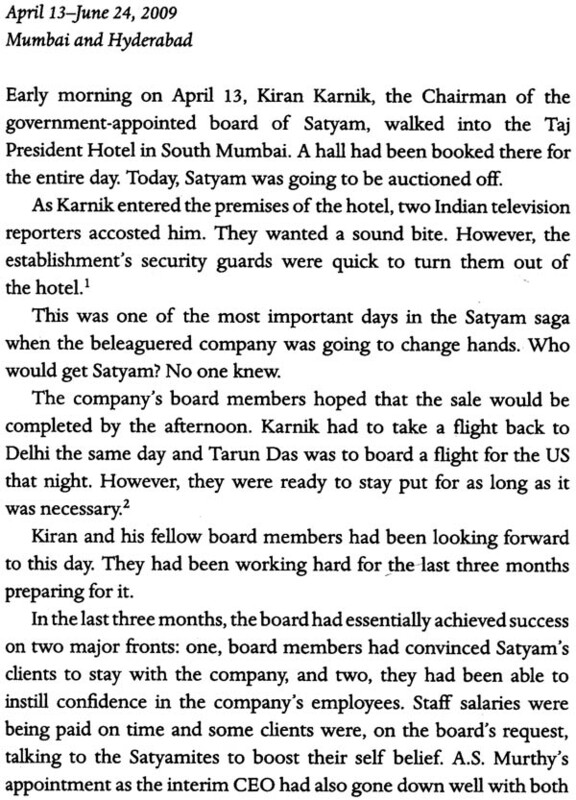 I chanced upon the Satyam story in an unusually casual manner. It was January 7, 2009 and I was back in my Singapore office after the Christmas holidays. 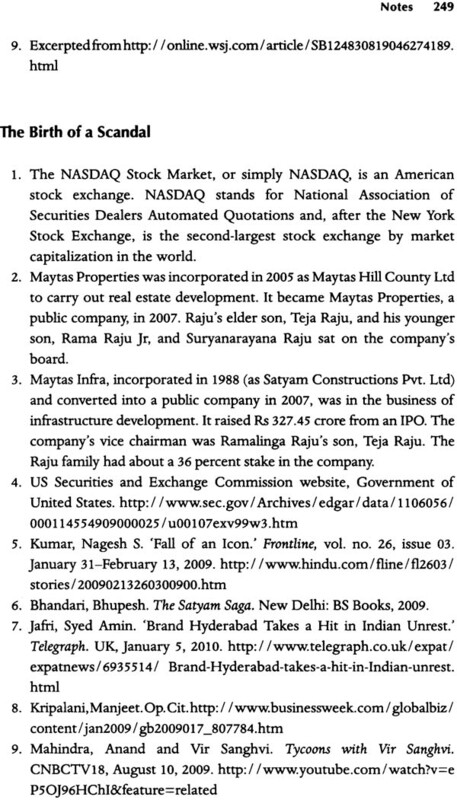 As I was settling down into my routine and browsing the Internet, there was this curious piece of news about Satyam's Founder and Chairman, Ramalinga Raju, having admitted to cooking the books of his own company to the tune of US$1 billion. The story seemed incredible. Was it a bad New Year joke? I read one story, then another, and another. The piece of news was as far from being a joke as possible. It was in the newspapers, on TV; and all over the Internet. It was everywhere. 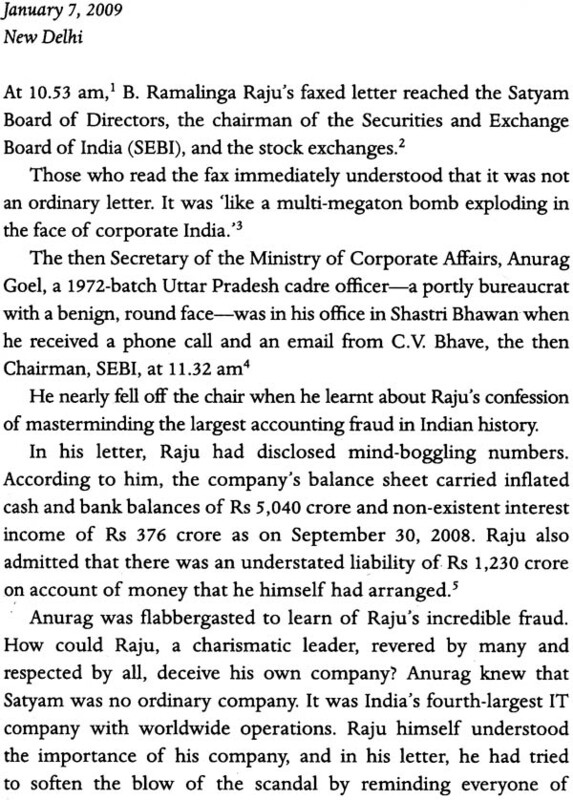 The news of Raju's fraud sent shockwaves throughout India's corporate sector. 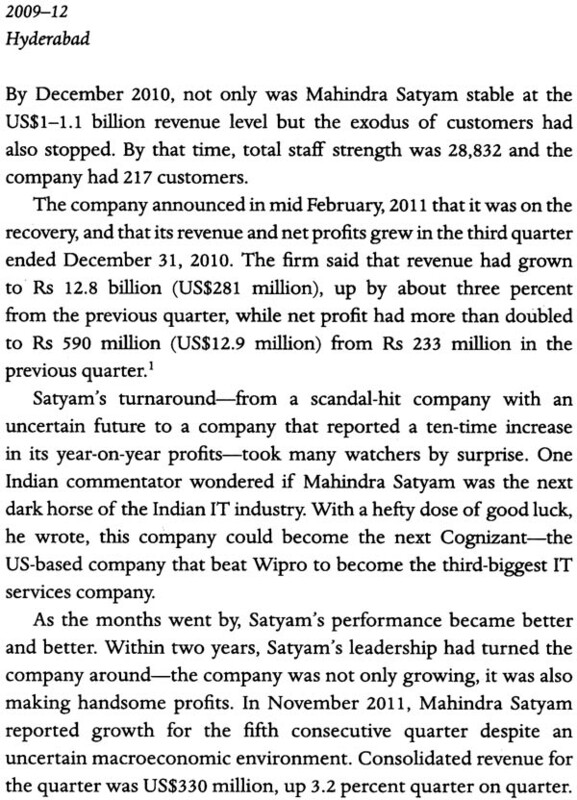 Satyam, India's fourth-largest outsourcing services provider, was a big name, a big brand in the country's IT sector. It counted 185 of the Fortune 500 companies among its portfolio of around 600 clients, which included international brands such as General Electric and Nestle. 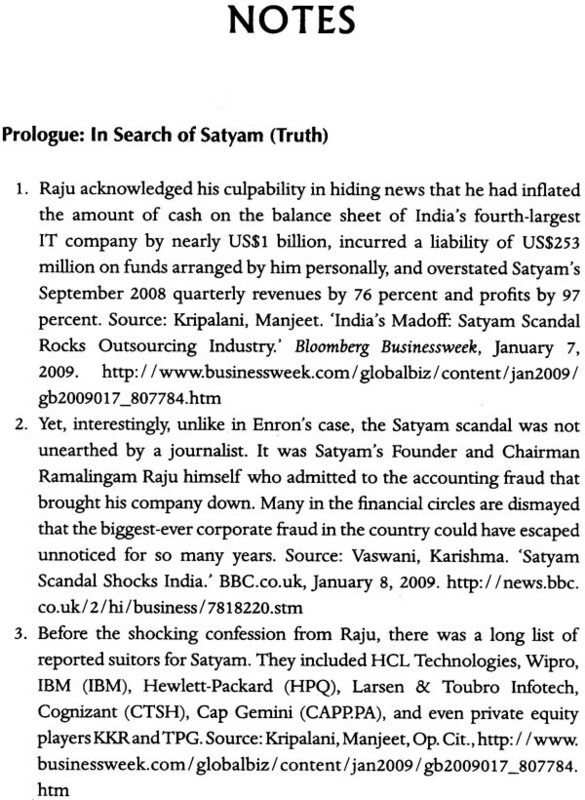 In the next few days, the Satyam scandal snowballed into a global story and it was dubbed as India's Bnron.! Like all scandals that feed media frenzy and stoke popular imagination, people had burning questions about this one too that needed answering. Why would an iconic entrepreneur like Ramalinga Raju do something like this, and then admit his crime? What forced his hand into making such a confession at that particular time? Was it political pressure brought on him that forced him to confess? Or was it a cover to hide something ever bigger? Nobody had the answers. All the public had was a letter of confession written by Raju and a lot of speculation and gossip. In the backdrop of the global financial crisis and the schadenfreude owing to the success of the Indian outsourcing industry, there was tremendous interest in the story. As the online editor of four of Asia's top technology magazines (CIO Asia, MIS Asia, Computerworld Singapore, and Computerworld Malaysia), I immediately knew that my readers too would want to know what travails awaited this beleaguered giant. I remember running a few blog posts and hosting a special podcast on this topic. I called some of the top outsourcing analysts in the region and asked them what they thought of the scandal and how they saw the future of Satyam. That podcast became one of the most popular downloads on our website and remained popular for about two years, indicating people's interest in this extraordinary story of corporate misbehaviour. Satyam's fall was a big story because it had serious implications for the entire Indian IT services industry. It was not just about Satyam's 53,000 employees who faced uncertainty. India's image was at stake. The world was questioning India's ability to handle a crisis like this. Doubts were also raised over India's judicial system-the suspicion was that Ramalinga Raju would be let off the hook with light punishment. The air was rent with negativity and questions about Satyam. Most outsourcing trade pundits agreed that Satyam had no chance of surviving as a company. Satyam had hit an iceberg and, like a shipwrecked vessel, its assets were likely to be bought over by different companies-piece by piece. Even after the government appointed a board to stop the haemorrhage at Satyam, the company's fate seemed bleak. 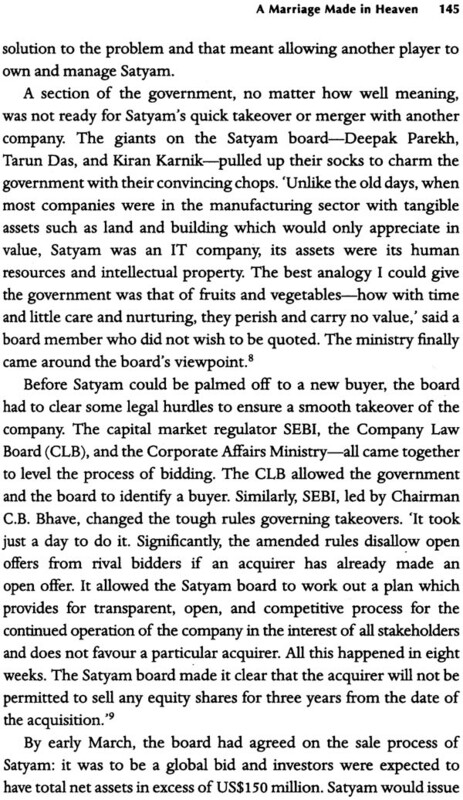 Ironically; before the scandal, Satyam faced the danger of corporate takeover.' Post-scandal, however, as the auditors scrutinized Satyam's cooked books, no corporate house showed interest in touching Satyam even with a barge pole. Not even Tech Mahindra initially which went on to make a successful bid for the company." Internally, the challenge for Satyam as a company was to keep its spirit alive amid a severe cash crunch and loss of market confidence. 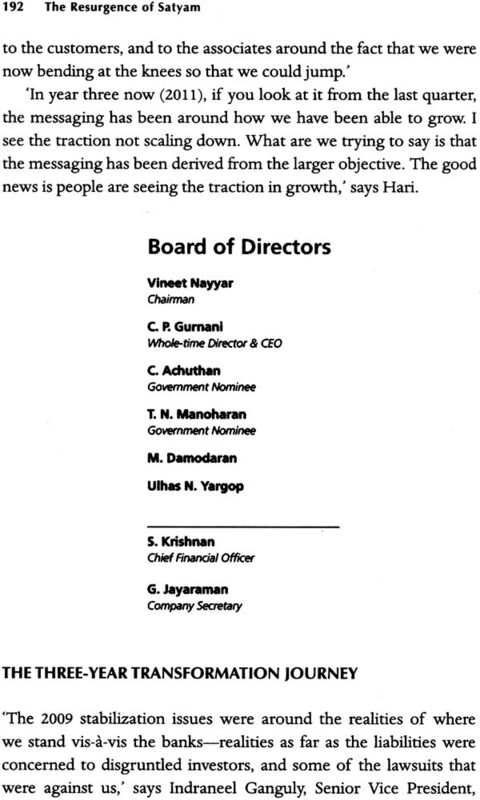 The Satyam leadership was struggling to retain employees and customers. There were all kinds of rumours going around to make things worse for them. Unfortunately. I was not in India where the main story was developing. However, since Satyam had a presence in Singapore, I began to cover the company's affairs from an Asia Pacific (APAC) perspective. 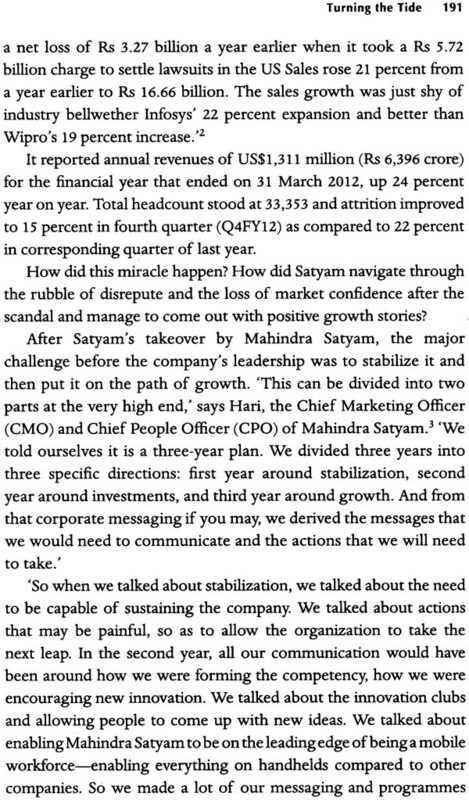 Though I too had my doubts about Satyam surviving the crisis, I was nevertheless impressed by the resilience of the company's staff. The image of the handprints that Satyam's employees had put on a wall poster-with the slogan 'The Spirit of Satyam' acted like a beacon of hope in my mind. That image seemed to draw me to the Satyam story more and more. In Singapore, Rohit Gandhi, the company's APAC chief, used to brief the media on all matters related to Satyam after Tech Mahindra acquired it. Over the months and years after the acquisition, I followed the developments at Satyam-the company's restructuring and rebranding, the institutionalizing of the Shadow Board, the winning back of old customers and bagging of new deals, Satyam's coming out party at the 2010 FIFA World Cup held in South Africa, and so on. Within a year-and-a-half of being acquired by Tech Mahindra, Satyam, now christened Mahindra Saryam, had staggered back to life. By the third quarter in 2010, it was back in good shape." Though it still had some battle scars owing to the mortal blows delivered by the scandal, the company began to display the swagger of a boxer who had come out a winner in round one, and was raring to go for round two. 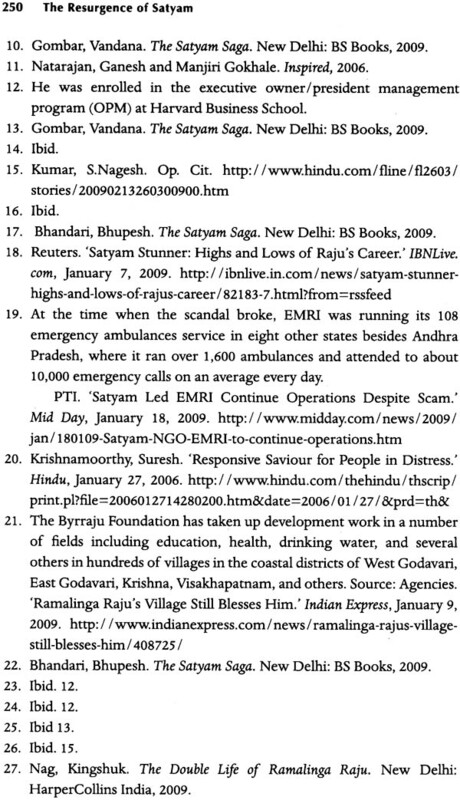 When I met Rohit in early 2011, I expressed my desire to do a book on Satyam's amazing turnaround. He enthusiastically backed my idea. He told me that Harvard Business School was also interested in doing a case study on the company. In the next few quarters, more good news flowed from Satyam. The company's turnaround-from a scandal-hit organization with an uncertain future to one that reported a ten-time increase in its year-on-year profits-took many watchers by surprise. One Indian commentator wondered if Mahindra Satyam was the next dark horse of the Indian IT industry. With a hefty dose of good luck, he wrote, this company could become the next Cognizant-the US- based company that beat Wipro in 2011 to become the third-biggest IT services company. 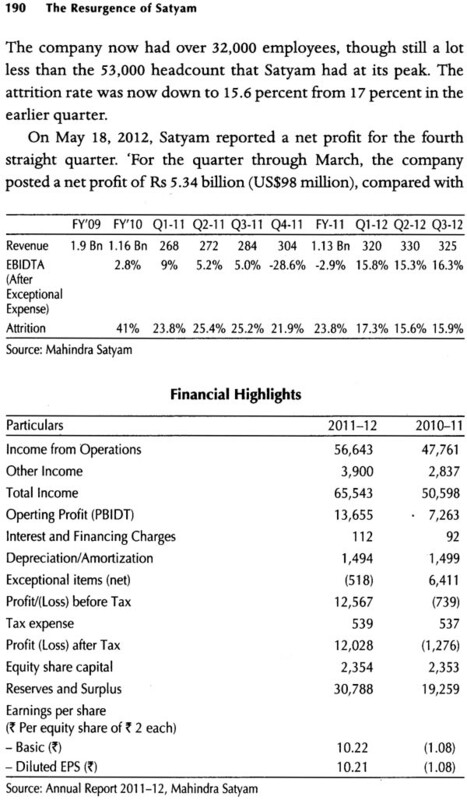 This kind of performance by Satyam had me hooked to the idea of doing a book on the company's revival, mainly to satisfy my own curiosity. How did it get a second life? How did a shipwrecked vessel pick up its splinters and set sail with new fervour-that's what I wanted to know, In a time of unprecedented crisis, how did the 'Spirit of Satyam' stay alive? Who were the stand-up guys when the chips fell? How did they save the day? How did this phoenix raise itself up from the ashes to take flight? And where was Satyam now headed? I wanted answers to all these questions and wanted to convey them to my readers. If I succeeded, I thought it might shed some light on this fascinating chapter in the corporate history of India. On September 1,2011, when I first met Mahindra Satyam's CEO, C.P Gurnani, at Tangling Club in Singapore, he was kind enough to express his support for my project. 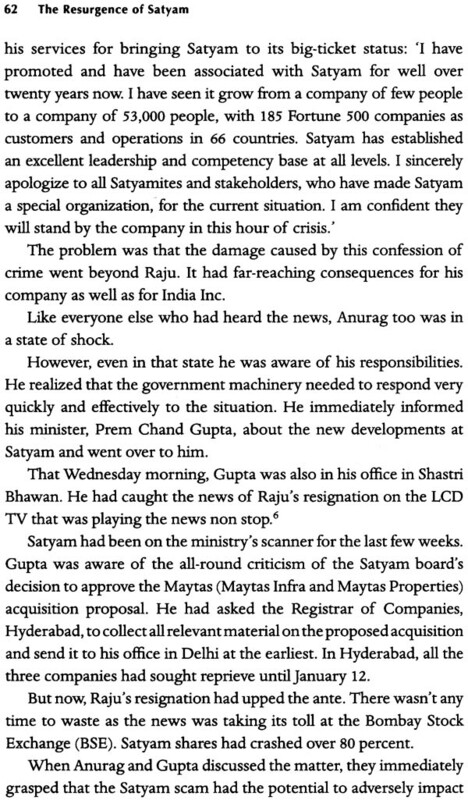 At the meeting, Gurnani told the gathering how Satyam's success had silenced its critics. 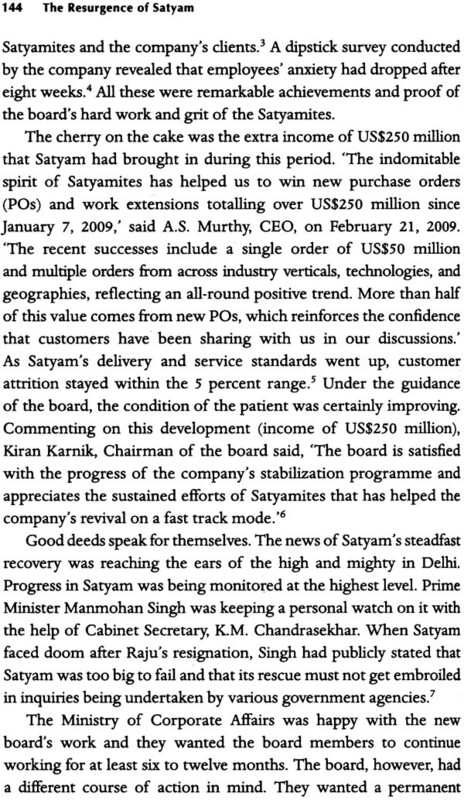 Satyam's turnaround was a slap across the faces of all those, including some from the media, who had doubted the company's survival. After hearing him, I was more than sure that I had to do this book.